A little secret to hydrate and be healthy, I’m not one to drink water, so I found a great tip to the trick… infusing your water with just about any combination of fruits, and herbs… you combine anything under the sun and let it sit in the fridge overnight and the next day you get to enjoy… here is a couple of combinations I just love. 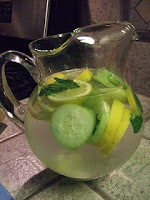 Mint, Lemon, Cucumber & Ginger – helps you shed a couple of pounds. Apple (I love Granny Smith), sticks of Cinnamon – energy booster. Green Tea, Tangerine, Mint – metabolism booster.